I’m Ginevra, I’m 27 years old and I’m originally from Milan. I’ve always been a gypsy and love to travel so when I finished school I moved to Madrid to study psychology. 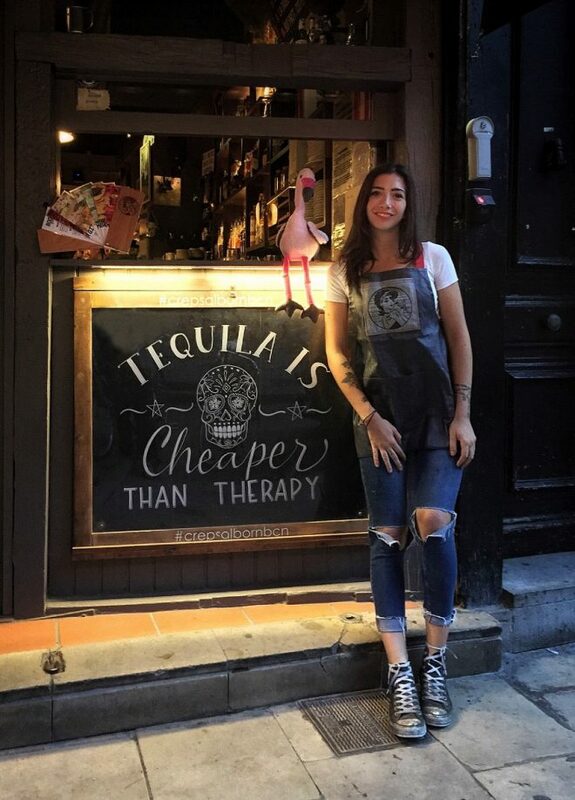 After I got my degree I decided to travel around Spain and worked in bars to make money. I found I preferred working behind the bar to psychology and someone suggested if I was serious about bartending I should move to Barcelona. I booked an airbnb and it happened to be just around the corner from Creps al Born, where I went my first night and instantly fell in love… I’ve been here ever since. There’s no place like Creps al Born. We all work hard and dream big. Each day we aim to have the best shift, create the best cocktails, play the best music and make magic. We are more than just a crazy family, these people are my tribe. My other passion is promoting and supporting females in bars, which is why I entered the Cointreau Queens, a cocktail competition only open to women working in the industry in Spain. I don’t know where my bar would be, but I would want it to have the essence of Creps al Born. I’d have all women behind the bar who are judged purely on their talent. The interior would feel like a theatre and I would like it to have an element of cabaret or burlesque. For me, music is an important part of a bar and the overall experience, so it would be a focus in my place. A friend recently gave me a daschund for my birthday and he’s like my baby, so I spend a lot of time with him. I also hang out with my friends and love to do cross-fit and other types of exercise. I’d say whisky as it’s the most difficult to work with and learn about. There is also such a wide variety of whiskies to work with in cocktails. I think a good cocktail is one the client likes and enjoys. I love working with new ingredients and at the moment I am using oils. For the cocktail I made below, I’ve actually created a curry oil coloured by using charcoal. I’m sticking with ladies here too. In Barcelona go and see Ayana Prado at Dry Martini. In Madrid visit Arancha Rodriguez at Art Club and Ines Martinez at 1862 Dry Bar and in London you must talk to Carey Hanlon from Callooh Callay.